When I was pregnant with my fourth child and only daughter, Miriam, I bought a Fitbit toward the end of my pregnancy. The feature that I loved the most about it is that I could sync it with my phone and it would show who called or texted me. I decided I really needed this because I would be so busy with a baby and overall with four kids, especially when I’d be at home on maternity leave. It would be so convenient to be able to see if anyone called or texted without always having to keep my phone next to me. I got a very cute leather strap so it looked more like a watch then a Fitbit. I remember those last days of my pregnancy — I had a blue dress on that wasn’t a true maternity dress but it was so comfortable and worked out perfectly for maternity and I had a Fitbit on my hand and I felt ready to have a baby. I was so excited for the wonderful changes that were about to happen in my life. Of course I could never predict what would really unfold. 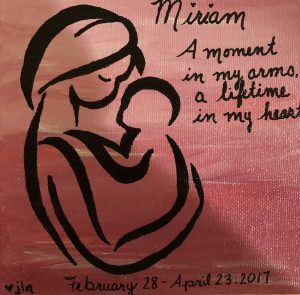 Miriam was born a beautiful baby, but feeding her in the hospital was a real struggle, I was exhausted as I was leaving the hospital and I didn’t think about the Fitbit again when I came back home and started a painful process of trying to feed my baby and pumping in between feedings, thinking that maybe my milk supply was the problem. Miriam cried nonstop for the first few days and then switched to being very lethargic and always sleeping and crying with a weak cry. I continued struggling with her feedings, switching to the bottle, trying my own milk and different formulas, going to the lactation consultant and going to the pediatrician daily to check her weight. I still had three other kids to take care of and the Fitbit was the last thing on my mind in those days. I was hoping that once feedings got under control things would become normal. Instead, everything crashed. Miriam was hospitalized and found to have a progressive terminal mitochondrial disease and was dying. We learned that she would never recover and she would never come back home. We returned from the diagnosis in the hospital to our house that was full of pink baby stuff. Miriam was at home for only 19 days but as she was our baby girl after three boys, all our friends and family were thrilled for us and we now had tons of beautiful gifts – balloons, toys, dresses, hand knitted hats and blanket, an adorable doll. We had also bought her a bright pink bathtub, she had two bassinets, and many other things all over the house. We knew that our future that had just started was over and all those things that held so much promise and joy would no longer be needed. In one of those awful days, I noticed my Fitbit lying on the bathroom counter. I couldn’t look at it. I think I opened a drawer and stuck it all the way in the back and moved other things over so I couldn’t see it. I never thought about the Fitbit again. It is now almost two years since Miriam died. We will always be grieving her death but thank G-d we are still incredibly busy. I have recently started a new job. I’m also busy with a volunteer activity for United Mitochondrial Disease Foundation that I’m doing in Miriam’s memory; and even though we don’t have our baby girl, our three boys are very active and keep us busy all the time with their multiple and overlapping activities and social schedules. In fact, I have gotten so busy that I started thinking about the Fitbit again and was thinking it might be nice to find it so I could see who texted and called me without having to keep my phone next to me all the time. So I started looking for it, but couldn’t find it anywhere. I did not remember where I had put it two years ago and thought it must’ve gotten lost. Finally, a few days ago I decided to reorganize things in the bathroom, and as I went through one of the drawers, I saw the Fitbit stuck at the very back of the drawer. I took it out and put it on the counter. I couldn’t put it on right away anyway because I needed to find a charger. But that wasn’t the only problem. 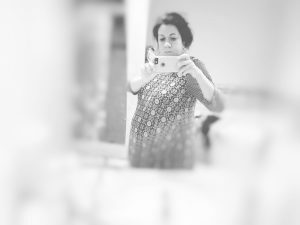 As I was looking at the Fitbit for the first time in almost two years, I was transported back in time and saw myself again in the last days of my pregnancy, in a blue dress, feeling so excited and ready to meet my baby, so full of hopes and dreams that were never meant to be. I hope that I’ll eventually order a charger and use the Fitbit, but for now, I’m letting it stay on the bathroom counter so I can look at it every day and see if I feel like I can use it again. I don’t know yet.